Cruz has hit .362 over his last 13 games. Truth be told, Nelson Cruz really didn’t feel all that well over the weekend in Tampa Bay. 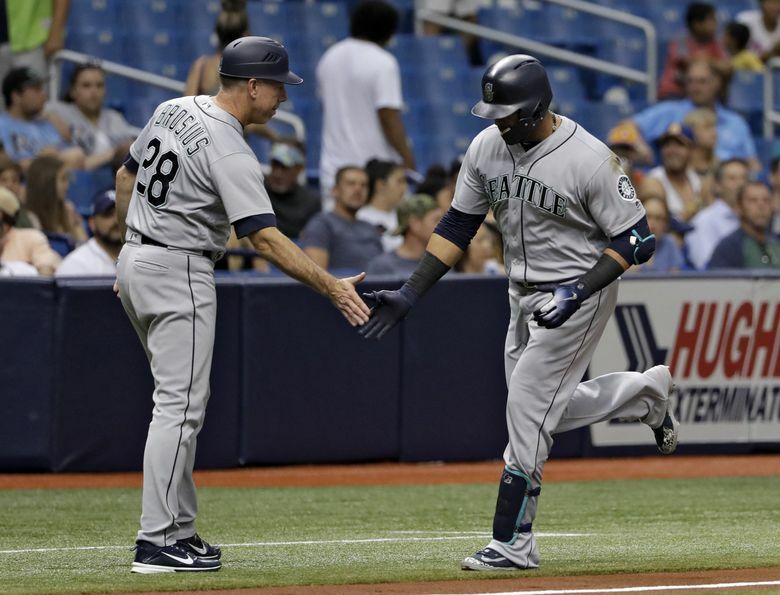 As Mariners manager Scott Servais revealed Monday, the veteran hitter dealt with migraines during Seattle’s trip to Florida. But as Servais also said, few watching would have known. Cruz hit home runs each of the final two games in Tampa Bay giving him a team-high-tying 13 for the season (Mitch Haniger also has 13) and continuing a recent hot streak that has seen him raise his average from .219 on May 27 to .254 entering Monday night’s game against the Angels. In 13 games since May 28 Cruz has hit 17-47 (.362) with five home runs, including hits in six in a row. While Cruz had the migraines over the weekend, he more importantly finally appears recovered from the litany of health issues that have plagued him this season, most recently being hit by a pitch on his foot on May 15. Servais said the turnaround isn’t due to anything magical, just the return to health and the constant refining of his approach that even veterans such as Cruz have to make a regular part of their routine. Crazy ending still a topic of discussion a day late: Servais was still marveling a day later over the ending of Sunday’s game, when Haniger threw out Tampa Bay’s Johnny Field at the plate after Rays’ third base coach Matt Quatraro decided to send field when Haniger initially had difficulty controlling a short fly to right off the bat of Carlos Gomez. Field ended up being out by about 15 feet or so. But Servais said he thought the Rays did the right thing. “Understand we have our closer on the mound,’’ Servais said of Edwin Diaz. “He’s a hard guy to get a hit off. The ball is kind of getting kicked around in short right field — why not take a shot? The result was a 5-4 win and Seattle’s 21st one-run win of the year. — Reliever Nick Vincent, on the disabled list since May 27 with a strained groin, threw a bullpen before the game and Servais said that assuming he has no setbacks he will go out on a rehab assignment this week. Servais said Vincent would likely need just one rehab assignment before he could return to the roster. — Catcher Chris Herrmann, on the DL since May 30 with a straight oblique, was expected to take batting practice on Monday and is also expected to go out on a rehab assignment later ths week.